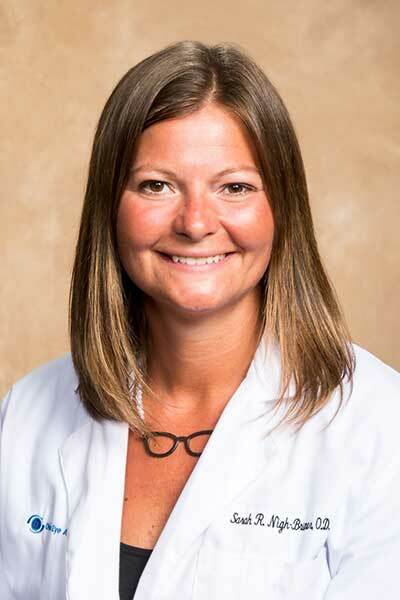 Dr. Sarah Nigh-Bruner is a certified Optometrist practicing at Ohio Eye Associates since 2012. She holds clinical privileges at Med Central Health Systems. She practices at the Mansfield andBucyrus locations. Sarah attended The Ohio State University, where she received her B.A. in psychology while competing on the NCAA Varsity swim team and served as Team Captain her senior year. She then earned her Doctor of Optometry degree in 2006 from The Ohio State University College of Optometry. Excited to bring the exceptional eye care to her hometown, Dr. Bruner opened an Ohio Eye office in Bucyrus. She enjoys co-managing LASIK and cataract surgeries. She loves people of all ages, and enjoys providing care for routine eye exams along with the management of eye diseases including glaucoma, diabetes, and macular degeneration. When she is not working, Dr. Bruner loves spending time with her family. Her husband Jakeis a high school principal at their alma mater Colonel Crawford. She has 3 children; Kaden, Brynn, and Trey. She can be found helping share her passion for swimming as she helps with the YMCA swim team and Colonel Crawford Junior high swim team.